These are some thoughts of mine on the article that Bob Ramlow wrote for Nov/Dec, 2007 issue of Solar Today on sand bed heat storage. As you will see from reading the thoughts below, I'm a bit unclear, or perhaps even a bit skeptical of some of the stated advantages of the sand bed. I like the idea of the sand bed and its inherent simplicity, and would like to be shown that it really does perform well -- so, if you have more data on this, or think I am off base on some of the comments please let me know Gary.... If you have a sand bed storage house and would like to log its performance, I'd probably be willing to help out. This picture from Bob's article shows the sand bed concept. These comments deal with the article, so you probably want to read the article before reading the comments on it below. square feet (1 square meter) of the footprint of the building." Solar collector area by Bob's ground rule of 2 sf of collector per 10 sf of floor space would be (2000 sqft) (2 sqft / 10 sqft) = 400 sqft of collector area (not a small collector). Storage mass by Bob's suggestion of a 2 ft deep sand bed under the full 2000 sf living area would give (2000 sqft)(2 ft) (100 lb/cf) = 400,000 lbs of sand mass. The equivalent thermal storage weight of water storage would be less by the ratio of the specific heats of sand and water. That is, water stores about 5 times as much heat per lb as sand, so less water is required. A cube shaped tank to hold this much water would measure about 11 ft on a side (not counting insulation thickness). This assumes that the sand bed and the water tank are operated over the same temperature range. It seems likely to me that the water tank could be operated through a larger temperature band, especially for the fall seasonal storage phase -- this would reduce the size of the water tank significantly (see below). Maybe the 110F maximum temperature assumed above is too low? Can the house be comfortable when the storage under the floor is hotter than 110F? This article: http://www.radiantsolar.com/pdf/DOEREPORT.pdf would seem to indicate that even 110F might be too high. - Bob mentions that the 2000 sf example house is well insulated and has some passive solar gain, and is built to the ground rule above (400 sqft of collector and 4000 cf of sand bed storage) will have a good fraction of its heat supplied by the sand bed system. My first reaction to that is that 400 sf is quite a bit of collector area, and a well insulated 2000 sf house with some passive gain and 400sf of active collector is likely to have a good solar fraction with conventional water tank heat storage. 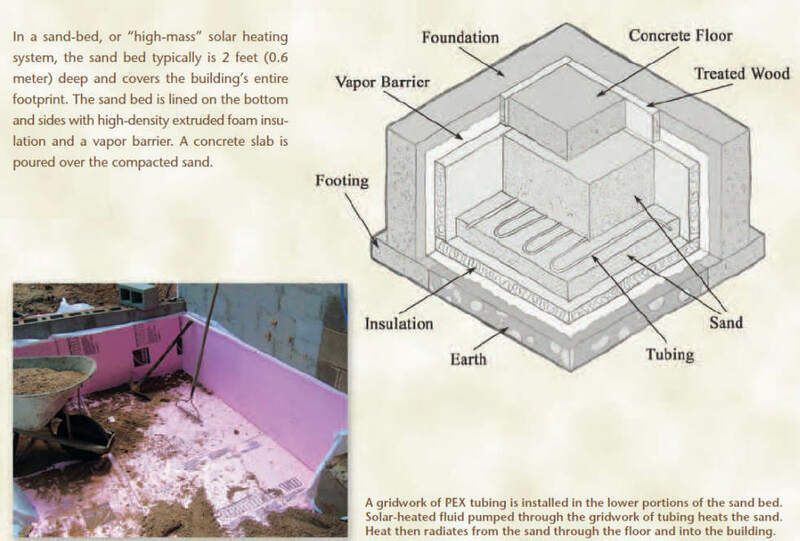 It would have been helpful to have more analysis to show the detail on how a house with the same 400 sf of collector and conventional water heat storage would compare to the same house with sand bed storage. - Seasonal Storage: The sand bed is charged in the late summer and early fall, and it will hold about 2.4 million BTU (see above). How does this compare with the full heating season demand for such a house? So, the 2.4 million BTU stored in the sand bed is about 2.4/34 = 7% of the heating season demand. I guess this illustrates how hard it is to store a significant fraction of your full winter heating needs in a reasonable size heat store -- even for well insulated homes. - Useful storage temperature range: It seems to me that if you are directly over the sand bed storage, and it is tightly thermally coupled to the living area (as it must be to provide heating), then there has to be a limit to how hot you can let the sand bed get without overheating the house. This seems like a key element, but there is no mention (that I saw) of what the maximum sand bed temperature is. It would have been really helpful to provide a log of sand bed temperatures at the top bottom and middle of the sand bed for a full heating season. With data logging systems only costing a few hundred dollars these days, it seems a shame not to carefully document the actual performance of these very interesting sand bed storage homes. If a large water storage tank is used instead of the sand bed, the upper temperature limit could be quite a bit higher because the tank is not directly thermally coupled to the living area. The 11 ft cube tank mentioned above, which is the equivalent thermal mass of of the 4000 cf sand bed could actually store quite a bit more heat than the sand bed going into the winter. For example, if it were run up to 170F in the late summer/early fall, it could store about (170F - 80F) (80,000 lbs)(1 BTU/lb-F) = 7.2 million BTU instead of the 2.4 million for the sand bed -- 3 times the seasonal heat storage capacity for the same thermal mass heat store. Again, the maximum temperature that you can get the sand bed up to and still not overheat the house seems like a very key issue. "What Makes Sand Good for Storage? system has 100 times the weight of the water-storage system. quickly through a sand bed toward cold." - It seems to me that a water tank storage of only 500 gallons for 400 sqft of collector and a well insulated 2000 sqft house is too small. If you figure a rough net gain of 800 BTU/sf of collector on a sunny winter day, the 400 sqft collectors will be able to send about 320K BTU of heat to storage. The well insulated house with an average outside temp of 30F will have a heat demand of about 190K BTU for the day (less with some passive solar gain). So, even in a single sunny day, a 500 gallon storage tank would be on its way to overheating, and a series of sunny days would waste a lot of solar heat because the tank would be too hot to accept it. It seems to me that the 1.25 gallons of storage per sqft of collector is OK for a typical solar heating installation where the home heat loss is relatively large (due to average insulation), and the collector area is relatively smaller relative to the home floor area, but its to low for a well insulated house with lots of collector area. - As mentioned above, the low heat capacity of sand compared to water and the larger temperature range that you can operate a water heat storage tank over would allow a much much smaller than 200 ton capacity tank store the same amount of heat as the sand bed in the fall. It seems to me that a water tank of around 3000 gallons (a 7.5 ft on a side cube) would provide about the same seasonal heat storage as the sand bed and would be a not so bad match (if well insulated) to 400 sqft of collector on a well insulated 2000 sqft home. The 320K sunny day heat harvest would warm a 3000 gallon tank about 13F. If this proves to be a bit too much tank, perhaps the water tank would want to be partially drained after the seasonal fall storage has been used? Or, the tank might be partitioned, or two tanks might be used? But, if the tank is well insulated, a gain of only 13F on a sunny day might be fine -- it would increase in temperature slowly over several sunny days, and decline slowly over cloudy days as the house took heat out of it. - I don't understand the "heat dissipates quickly in water" comment. The heating system can draw as much heat as it needs from the water tank when it needs it. It seems to me that the heat from the water tank dissipates at whatever rate the house needs it? With the sand bed, it seems to me that since the thermal store (the sand) is directly coupled to the living area, the heat transfer rate to the living area will depend largely on the temperature difference between the living area and the heat store. When the heat store is hot, there will be a higher rate of heat transfer than when the store is cooler. This seems like a disadvantage over the water tank system in that what you really want is a heat transfer rate to the living area that depends on how cold it is outside -- it seems to me that the water tank storage with an appropriate control system gives you this, while the sand bed does not? Maybe I'm missing something? One item that is not mentioned in the article is the heat loss to the outside from the storage tank. This seems quite high -- its not a whole lot less than the heat loss for the whole house. I have to wonder how much of an issue the heat loss from the sand bed storage to the surrounding earth is. It seems like a very large heat transfer area between something you want to keep its warmth and the cold dirt, and only R10 between them? This is less than a tenth of the rough estimate of sand bed loss, and some of this loss would be recovered because the tank is located in a semi-conditioned area. Again, these are very rough estimates, but they do seem to me to indicate that heat loss from storage is a more difficult proposition with the sand bed storage than for a water tank storage system?